Rescue efforts in eastern Zimbabwe picked up the pace on Tuesday in distressed areas from Cyclone Idai's trail of destruction with nearly 100 people dead and hundreds missing. Poor weather conditions and destroyed infrastructure hampered efforts by the military and humanitarian agencies to reach thousands of stranded people. A massive landslide blocked access to the town of Chimanimani - about 400km southeast of the capital Harare - and there was limited access to the worst-affected areas by air. Mozambique has been hardest hit with the president saying more than 1,000 people may have been killed. Dozens have also died in Malawi. Bulldozers and road graders struggled through the night to clear obstructed muddy roads in parts of the Chipinge and Chimanimani districts. In the previously inaccessible villages of Sanctuary, in eastern Chimanimani, the army handed out basic food items - beans, mealie meal, and cooking oil - to hundreds of affected families. Zuze Zubuka, 53, who lives on one of Chimanimani's lower mountain slopes, told Al Jazeera the roof and walls of his three huts were blown away by the rain. Now he and his family of eight squat in a small shack near the original home. Up the road, Zubuka attended the funeral of an in-law, Morgan Chimene Dube, crushed by falling rocks while sleeping in his home as Friday's massive storm hit. "I have lost my home, it was impossible to escape the rain, we were trapped but now that the roads are cleared we can move. I came to see how my brother-in-law was doing, but he is dead now. "We have lost a relative, our fields and our home. My family is there, but I don't know how we will start all over again," he said. Another mourner at the funeral Fortunate Saziya, 48, told Al Jazeera she was anxious and hoped for more help as she'd also lost her home. "Who can I give a list of all the things I have lost? Will we get any support for all we've lost? When is the government going to help us?" she asked. 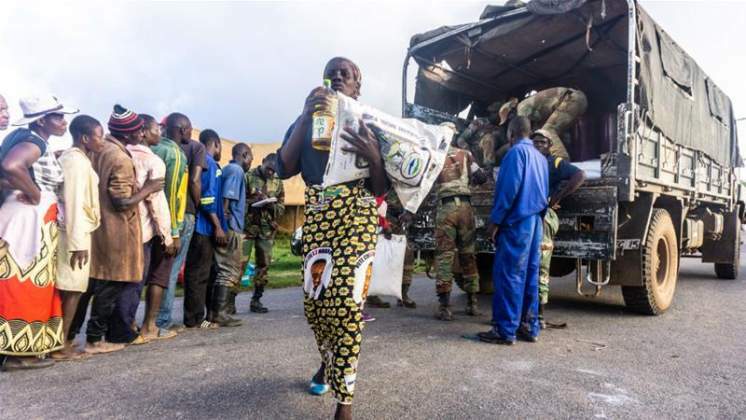 Minister of Defence Oppah Muchinguri visited the area and told victims she hadn't anticipated Cyclone Idai being so bad, lamenting the lack of preparedness by the community and the government. "We had heard that floods were coming and a cyclone, but we had not moved or done anything to help ourselves," Muchinguri said. "I think we as people of Manicaland [province] have learnt a lesson and next time we will protect lives and urge people to move knowing what will happen, and we move into camps together with the government's help," she added.